Kids are notoriously picky about what they will and won’t eat. Meal times around our house usually go one of three ways: Me playing short order cook, me bargaining with them to eat, or (more often than not) me giving up in the end and throwing out uneaten food. Seriously, when they aren’t feeling the menu I might as well be trying to coax a brick wall to move. They like to switch things up from day to day too, just to keep me on my toes. I can’t tell you how many times I have made sandwiches they gobble up one day only to have them swear they don’t like it the next. And you know what? Having two is the worst because what one does the other no doubt follows suit. So how do I ease this nonsense? By making it fun of course! 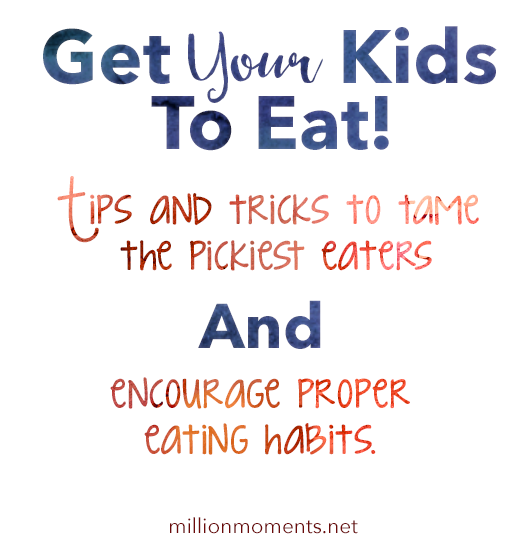 I have struggled and bribed and almost given up at times, but I have also learned a few tricks along the way to help ease mealtime meltdowns. 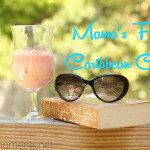 It all centers around getting your kid interested in the meal. If they don’t want to do something, they will dig in their heels and outlast even the most patient parents until we cave to their crazy strong will! It’s no fun for them to “have to” eat lunch – they need to view it as another cool activity they look forward to. Playing games or creating cute crafts to go along with each meal can help get them into it, and it doesn’t have to be complex or time-consuming. Something as simple as napkin art like this easy lightsaber napkin can bring a smile to the table. Cute, right? 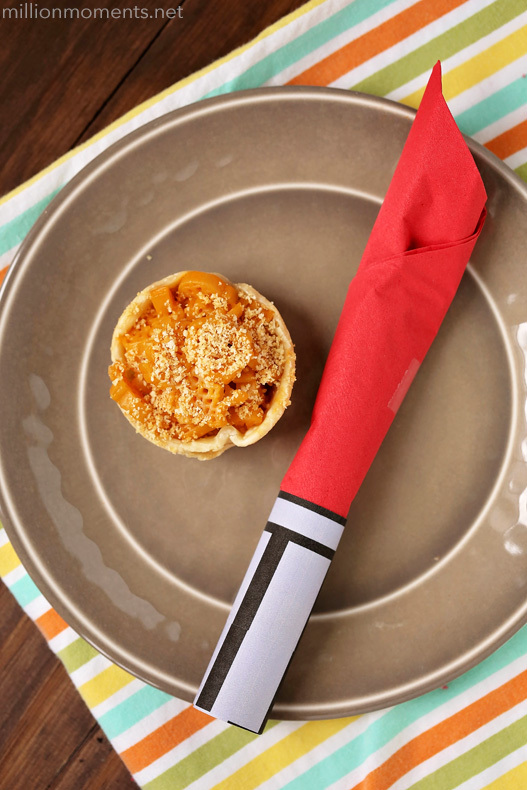 All you need to make one is a colored napkin and this printed graphic. 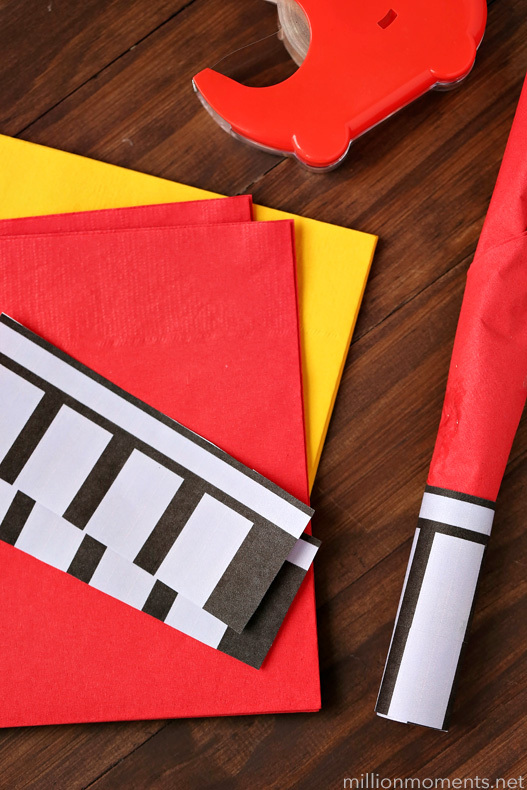 Just roll up, tape together and voila – instant fun! Kids love playing with their food. Imagination reigns supreme when you’re young, so cutting food into shapes can transform a boring meal into something fun. I mean, how fun is it to spell out your name in banana slices? Tons! But what about foods that can’t be cut? That’s when I’m thankful for brands that do the work for me. 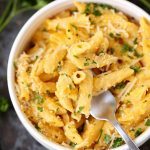 You know what I’m talking about – foods like KRAFT Mac & Cheese Dinner offer a variety of awesome pasta shapes and save meal time for parents everywhere. I remember growing up thinking their spiral macaroni was awesome, but shapes? Genius! 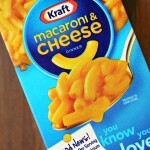 The kids adore KRAFT Mac & Cheese, so we keep a steady rotation. I love that they come out with new shapes periodically, like Star Wars featuring four cool collectible boxes. Oh yeah, and guess what? 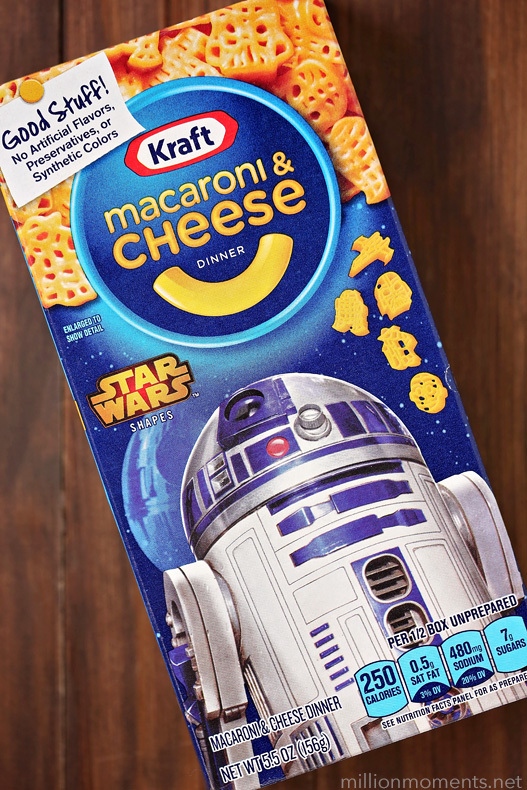 KRAFT’S Star Wars boxed shapes have no artificial flavors, preservatives or synthetic colors. That makes me feel good about serving it! Judah has really shown an interest in cooking and food preparation recently, so once a week I have been letting him help me with recipes. They aren’t always the prettiest, but they are fun, usually tasty, and making them with Judah is a great bonding activity. He is much more apt to eat things he has a hand in creating as well. This week’s food was KRAFT Mac & Cheese Dinner and he chose to make macaroni pies. 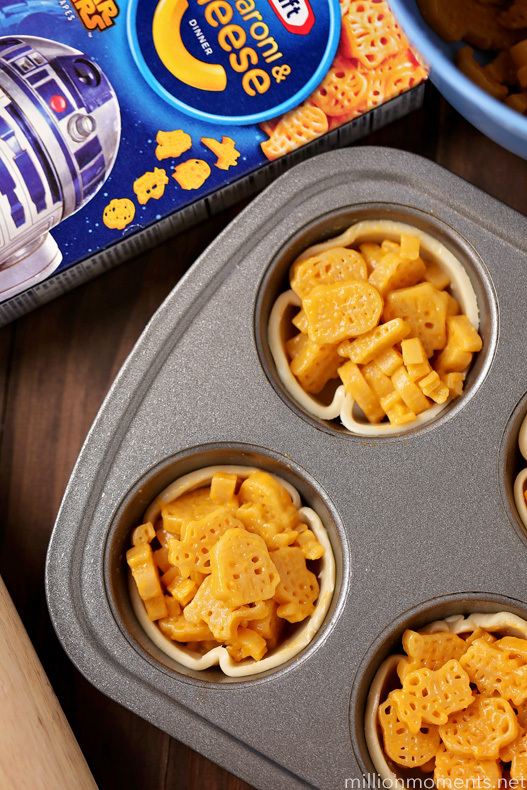 I started by cooking the mac & cheese and then spooned it into a muffin tin lined with tiny pie crusts. I let him cut out the (ready made) pie crusts and then helped him shape them in a muffin tin. He scooped the mac & cheese into each one and then I popped them in the oven for about 10 minutes. Please note: stay safe and keep kids away from the oven! 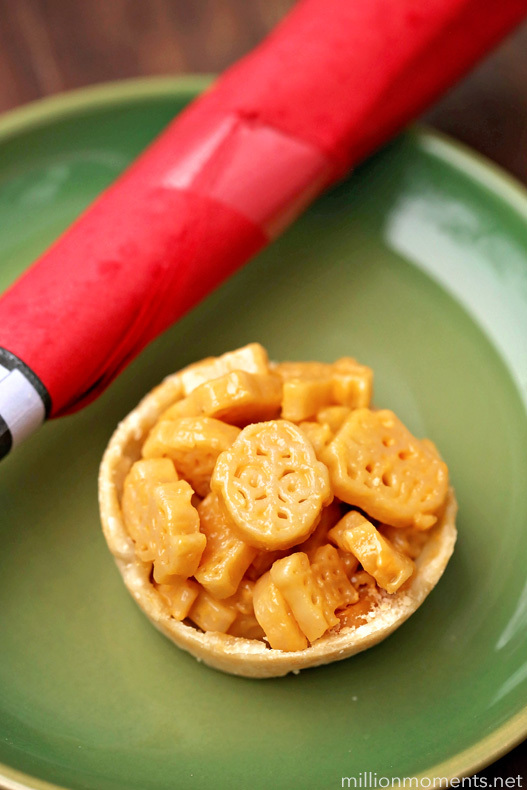 When they came out, we had six adorable mac & cheese “pies” and he was super proud of them! It’s hard to get kids to try new things. Kaia isn’t bad about it, but Judah is notoriously against new foods. He will gag before he even gets a chance to taste it because he has it in his mind that he doesn’t like it. Instead of torturing him with strange new dishes all the time, I make sure to keep his meals simple with the foods he likes to eat combined with one bite of a new item (with the “new” item being something on the family menu for that meal that the rest of us are already eating). 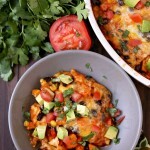 The “new” food can be anything – if we’re having broccoli casserole as a side it means I will fix Judah his normal fruit and whatever else along with one bite of the casserole. He doesn’t have to like it, but he has to eat one bite. If he likes it he can have more, but we don’t force him to eat a serving. He is much more prone to “open up” when he knows it’s just one bite, and once he’s tried it he has often found he likes it! These are just a few of the many simple ways parents can make meal times more fun for kids, do you have any of your own? I’d love to hear them!